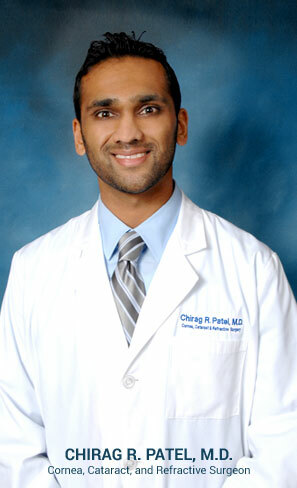 Home » Our Doctors » Chirag R. Patel, M.D. Dr. Chirag Patel grew up in the Bay Area and received his undergraduate degree with High Honors from the University of California, Berkeley followed by a Doctorate of Medicine from the University of California, San Diego. He performed his residency in Ophthalmology at the Vanderbilt University Medical Center in Nashville, Tennessee where he was bestowed with the honor of Chief Resident. He then spent an additional year to further his ophthalmic training with a Fellowship in Cornea, External Disease, and Refractive Surgery at the prestigious New York Eye and Ear Infirmary in Manhattan. Excited to move back home, Dr. Patel returned to the Bay Area and joined Turner Eye Institute. Dr. Patel specializes in the diagnosis and treatment of diseases of the cornea, anterior segment, and lens. He particularly enjoys cataract/intraocular lens surgery, refractive procedures (including LASIK and PRK), keratoconus treatments and corneal transplantation including cutting edge techniques such as partial thickness transplants. Dr. Patel is a member of numerous medical associations including the American Academy of Ophthalmology (AAO), American Society of Cataract and Refractive Surgery (ASCRS), Association for Research in Vision and Ophthalmology (ARVO), and The Cornea Society. Dr Patel looks forward to meeting you and is committed to providing you personalized eye care for many years to come.